There are countless animated shorts and feature films that have been released over the past nine decades featuring the most famous rodent in the world. Walt Disney may be best known for theme parks and princess stories, but Mickey Mouse will forever be the central figure of the Disney franchise. 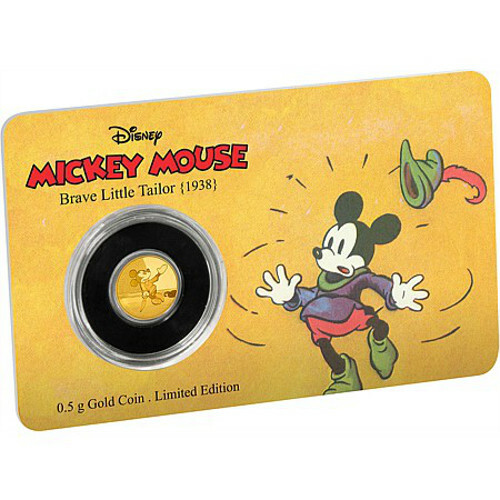 The 2016 ½ Gram Gold Niue Mickey Mouse Brave Little Tailor Series coin is available today on Silver.com in BU condition. More and more often investors are turning to uniquely-designed and foreign gold coins as a way to invest in gold as they are a great alternative to the more popular choices and can carry a higher buyback premium based on their rarity and the gold price per oz. Ships to you in a sealed plastic card. From the Mickey Through the Ages series of Disney coins. Consists of .5 Grams, or .016 Troy ounces, of .9999 fine gold. 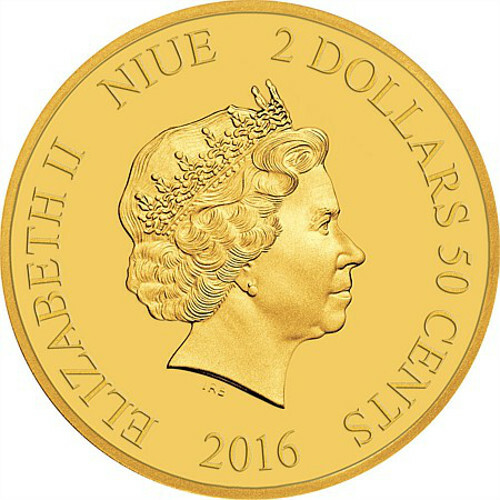 Issued a face value of $2.50 (NZD) by Niue. Reverse features the image of Mickey Mouse in The Brave Little Tailor. Walt Disney Productions and RKO Radio Pictures released the animated film Brave Little Tailor in 1938, featuring Mickey Mouse in the titular role of the humble tailor. The film is based upon the fairy tale “The Valiant Little Tailor” from the Grimm Brothers. In the film, Mickey plays the role of the tailor who takes on the monumental task offered by a king to kill a giant that has been terrorizing his small kingdom. Mickey steps forward inadvertently to become the town’s chosen warrior, bragging that he “killed seven with one blow,” not realizing the peasants were discussing warriors who have killed giants and not the flies he killed in his workshop. The film was nominated for the 1939 Academy Award for the Best Animated Short Film, but actually lost out to another Disney film in the form of Ferdinand the Bull. To this day, the Brave Little Tailor film remains one of the most expensive ever produced by Disney. 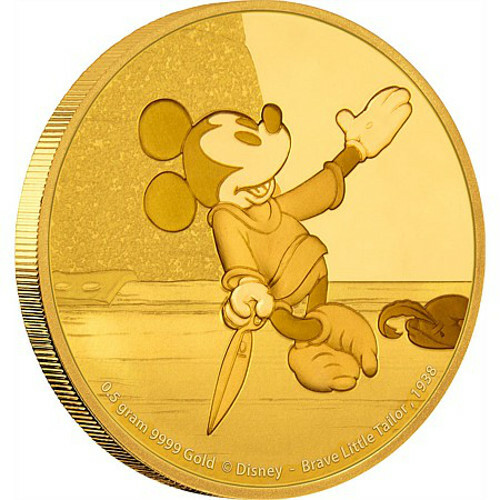 On the reverse of each 2016 ½ Gram Gold Niue Mickey Mouse Brave Little Tailor Series Coin you’ll find the image of Mickey Mouse as he leaves the town and sets out in search of the giant he must kill. The obverse of all coins in this listing have the right-profile portrait of Queen Elizabeth II. This effigy of Her Majesty was created in 1998 by Ian Rank-Broadley, and marks the fourth change in her appearance on commonwealth coinage during her 60-plus year reign. We encourage Silver.com shoppers to contact us at 888-989-7223 with any questions. You can also reach us online using our live chat and email features.